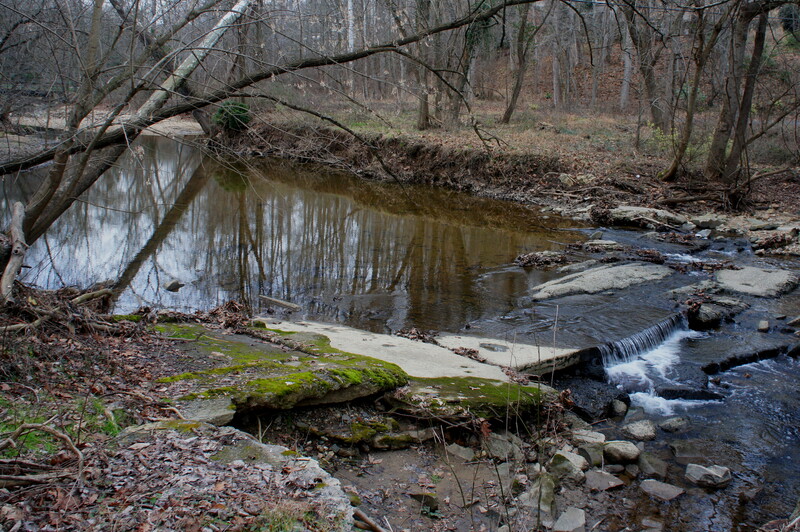 Generally less rip-roaring than several of its nearby tributaries, Pimmit Run nonetheless carries a rather significant volume. 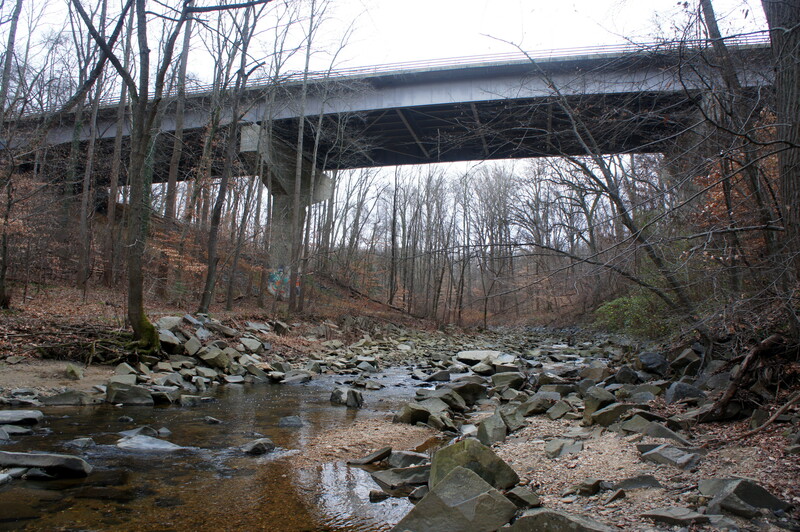 It weaves gently through McLean, Virginia—a generally upscale Washington, DC suburb—for eight miles before emptying into the Potomac River. Unpaved walking trails flank the stream for much of this distance, allowing for several relatively easy hiking opportunities. 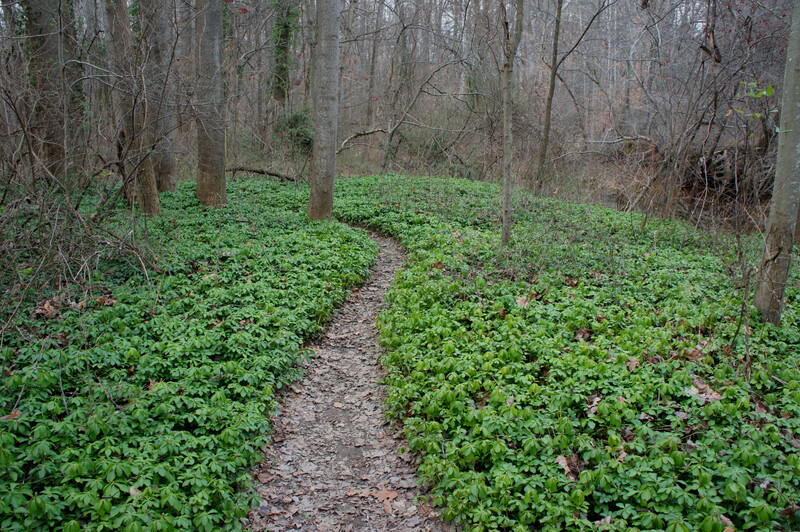 The first such option featured on Live on Let Hike is a 2.5-mile walk (including roughly 1/3 mile of road-walking) from Fort Marcy to Solitaire Lane in McLean, a pleasant stroll through the Pimmit Run Trail’s eastern stretches stretch that offers access to neighboring trails as well as Marie Butler Leven Preserve. The final 1.2 miles follow Little Pimmit Run, a Pimmit Run tributary. Fort Marcy, site of a key Union installation during the Civil War, serves as the best starting point for this hike. (Note: it is also possible to start at the intersection of North Glebe Road and Chain Bridge Road; this would add roughly 2/10 mile each way to the hike described.) By car, the only way to access Fort Marcy is along the George Washington Memorial Parkway heading northbound. (Note: Though signed, the turnoff is sudden, coming just after crossing a high bridge over Pimmit Run.) Park at the far end of the lot at Fort Marcy; it is here that the trail begins. The first 2/10 mile technically follows a section of the Potomac Heritage Trail, part of a long-distance trail system extending—with some interruptions—from Prince William County in Virginia all the way to Pittsburgh, Pennsylvania. After descending a brief S-curve, the singletrack path traces the bottom of a minor ravine to a series of stone steps leading down to the banks of Pimmit Run. GW Parkway rises high above to the right. Pimmit Run was named for John Pimmit, a French citizen naturalized in the American colonies who in 1675 was an overseer for Virginia lawyer and plantation owner William Fitzhugh (1651-1701). Pimmit drowned in 1688—though probably not in the shallow creek that now bears his name. Pimmit Run nonetheless runs a few feet deep in places, and high waters can make the initial creek crossing quite difficult. While it is possible to cross without getting your feet wet, hopping from rock to rock requires careful deliberation and balance. Once safely across to the eastern bank, the path splits: the Potomac Heritage Trail continues left (see here for a trail description) while the Pimmit Run Trail begins to the right. 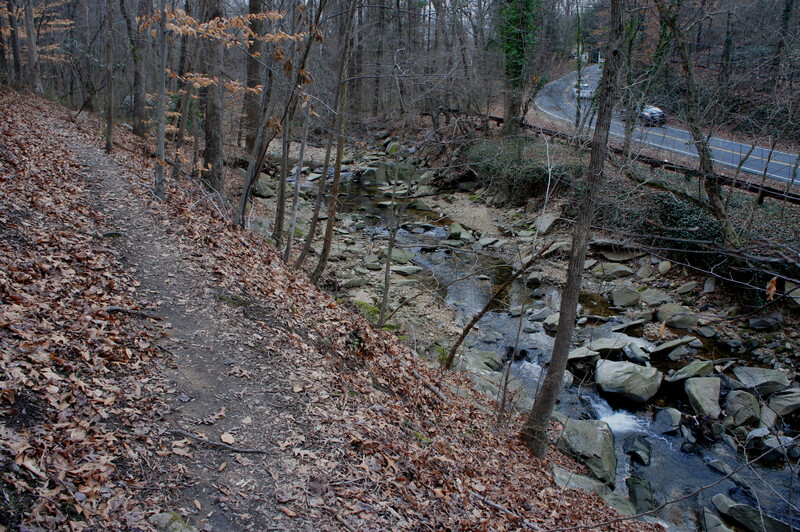 After passing under the GW Parkway, the Pimmit Run track runs through one of the hike’s less pleasant sections. While the stream is pleasant enough, odors from the local sewage line abound, and, as of January 2016, one of the minor tributaries crossed was tinged with orange, oxidized iron. Fortunately, shortly after passing the trail’s first fork (stay right), the smells disappear and the trail enters a pretty stream valley with sloping hills on both sides. Outsized houses flank the valley on the left. 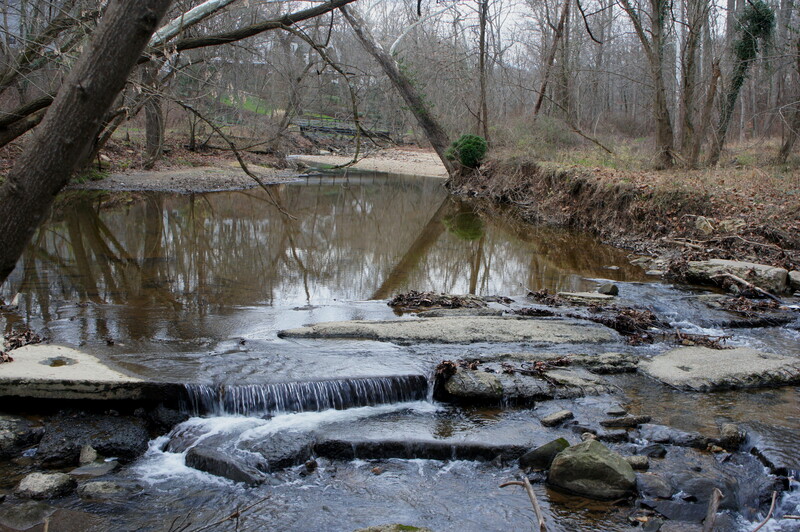 Around ½ mile from the trailhead, hikers cut across a flat and woody floodplain, then hopscotch across a small flowing creek. After a short climb, the trail rises to a point about 20 feet above Pimmit Run, offering a nice view upstream. Three-quarters of a mile from the start, the Pimmit Run Trail traverses a wobbly and rather precarious wooden bridge over a muddy ravine. By now the route is roughly level with GW Parkway, visible (and heard) across Pimmit Run. In the winter, a decent-sized patch of perennially green undergrowth at around 0.9 miles is a welcome sight. As of January 2015, one of the locals had placed a slew of lawn chairs and a hammock just beyond; down in the creekbed, sweeping branches and vines dangle above a minor rapid. Visitors reach arguably the most picturesque spot of the hike after about one mile of hiking: here the waters of Pimmit Run tumble gracefully over a slab of sandstone, with a still and peaceful pool just beyond. At the top of a picture frame is a pretty bridge, reached after another 1/10 mile of walking. This is Kirby Road, marking the end of the first, 1.2-mile section. Here the dusty trail gives way to smooth asphalt, surrounded by well-manicured grass and towering mansions (this is McLean, after all). Do not cross the aforementioned bridge; instead, continue down Kirby Road for a couple hundred yards to a second bridge. Turn left (at a set of six mailboxes) just before the crossing; here the (unmarked but obvious) Pimmit Run Trail continues. By now, Pimmit Run proper has been left behind, and the rest of the hike follows Little Pimmit Run. 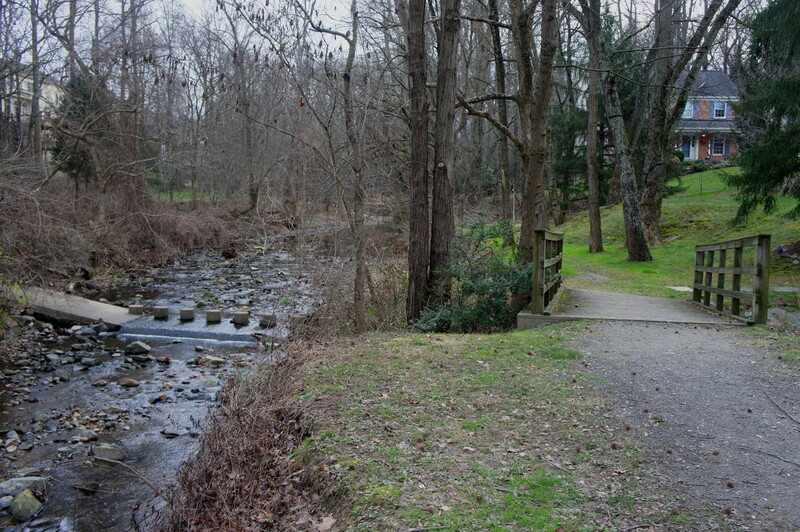 The trail leaving the street rises to a point well above creek level; Kirby Road continues roughly parallel to the stream on the opposite side. Approximately 1.5 miles from the trailhead, Little Pimmit Run bends around a mighty boulder, the largest seen (by my eyes, at least) on the hike. Beyond lies a dense stand of relatively young and thin trees, where the trail widens and is even partly graveled. The route flirts with a series of local backyards on the left. A half-mile from Kirby Road, the trail enters a small stand of obviously non-native bamboo: a peculiar sight in northern Virginia. Just steps further is the first crossing of Little Pimmit Run, assisted by the placement of hefty and flat stones. 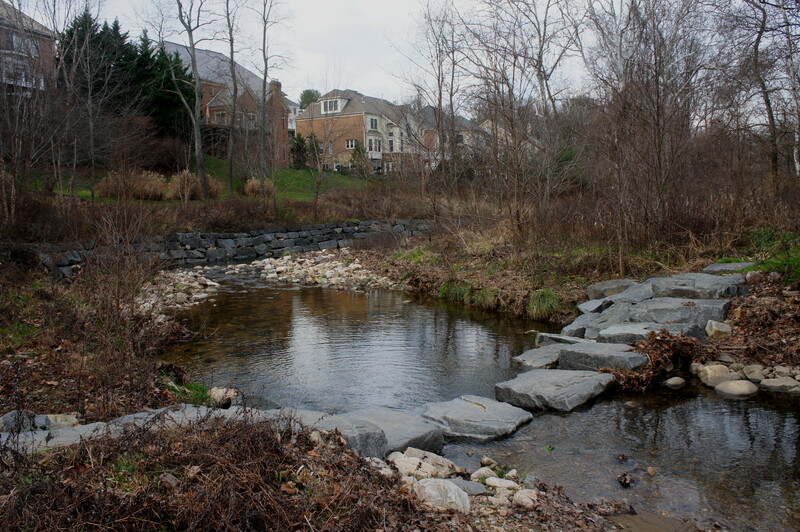 Having cleared the creek, the trail makes a beeline for Maddux Lane via an uphill slope between two houses. Many casual walkers will choose to turn back here. The third and final section, after all, is less interesting than the preceding legs and requires a bit of street-walking. One worthy detour, however, is a brief foray into Marie Butler Leven Preserve, situated directly across the street. It is possible to circumnavigate this small park (which boasts a pretty meadow, arboretum, and some scattered interpretive signs) in as little as 20 minutes before returning to Maddux Lane. Others—essentially those determined to see the entire 2.5 miles on the Pimmit Run Trail to the end—should head south on Maddux Lane (there is a sidewalk) for 1/3 mile to the junction with Chesterbrook Road. Cross the street, then a small wooden bridge, to begin the final section, a short, ¼ mile jaunt through Little Pimmit Run Stream Valley Park. The highlight is another stream crossing, this one assisted with concrete stepping stones. The final uphill to Solitaire Lane is paved with three sets of three wooden stairs each; the terminus at Solitaire Lane is situated roughly 2.5 miles from Fort Marcy. For the return trip, it is possible to explore additional parts of the “middle” section, between Chesterbrook Road and Kirby Road, but the path leads only a short distance before ending at Oakdale Road. Reconnecting with the Pimmit Run Trail at the creek crossing near Maddux Lane requires cutting through private property, a tangle of prickly vegetation, or both—and is therefore best avoided. Return by retracing your steps 1/3 mile up Maddux Lane, then follow the remaining 1.9 mile back to Fort Marcy. At a relatively slow pace—stopping frequently to take notes and pictures—I completed this hike, plus a loop around Marie Butler Leven Preserve, in around 2 hours and 15 minutes. Allot between 1.5 and 2.5 hours for the round-trip. 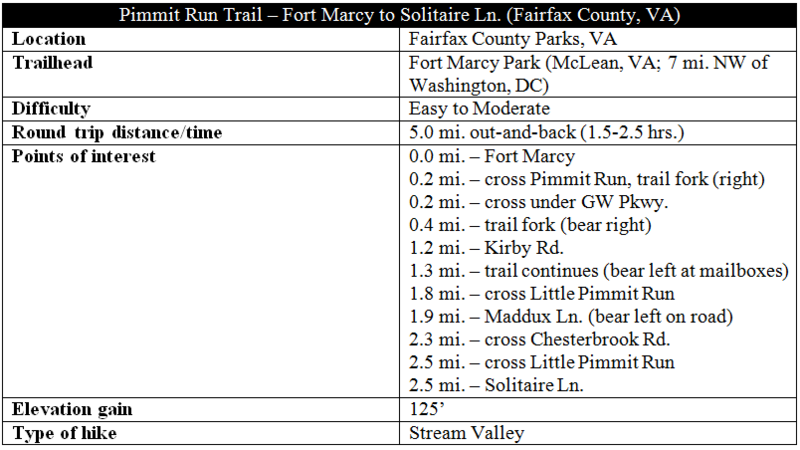 This entry was posted in Fairfax County Parks, George Washington Memorial Parkway, Moderate Hikes and tagged Fairfax County, Fort Marcy, George Washington Memorial Parkway, GW Parkway, Little Pimmit Run, Little Pimmit Run Stream Valley Park, McLean, Pimmit Run, Pimmit Run Trail, Potomac Heritage Trail, stream valley, Virginia. Bookmark the permalink.